French Laundry Home Alyssa Pillow, 20"Sq. French Laundry HomeAlyssa Pillow, 20"Sq. EXCLUSIVELY AT NEIMAN MARCUS Handmade pillow. Silk with rayon/cotton velvet lattice design. Dry clean. 20"Sq. Made in the USA of imported materials. Pillow made of linen with cotton lining. Feather/down fill. Zipper closure. 15" x 35" with 4" ruffle. Machine wash. Imported. 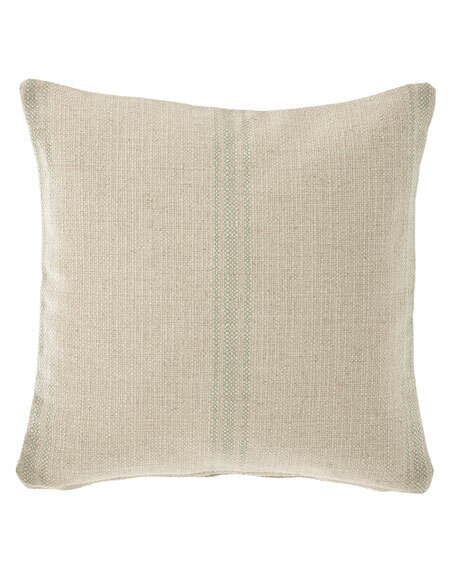 Sferra Embroidered Linen Pillow, 17" x 30"
Decorative pillow of European-woven linen. Embroidered front; solid back. Feather/down fill. Hidden zipper closure. 17" x 30". Coordinates with Embroidered & Quilted Percale bedding. Dry clean. Imported. Sherry Kline Home After Glow Boudoir Pillow, 14"
EXCLUSIVELY AT NEIMAN MARCUS After Glow patched boudoir pillow with solid welt. Linen/rayon. Feather/down insert. 14" x 19". Spot clean. EXCLUSIVELY AT NEIMAN MARCUS After Glow patched boudoir pillow with solid welt. Linen/rayon. Feather/down insert. 14" x 19". Spot clean. Made in the USA of imported materials.